Hello! How long do not make a wallpaper. And yes, I do addicted to Code Geass. Well, I used to get a black gradient to the bottom, and put a rain. Glassium gave a blur. After I applied the yield and posted a glow around the DC opinion that this really raining. It's a very nice effect of rain. After I applied more rain to fall on C.C. Then I put a brush of snow and I left him half blurry. In the end, I used a texture, wallpaper and was leaving the deeper, more brilliant in order to gain its own color. And then the wallpaper was all so colorful. I would use an earlier text, but would be very lame, so I preferred without anything even written. C.C. is real awesome! This is a good post! cool...I like her BG..black and green..
She is looking hooot! Anyway great wall. 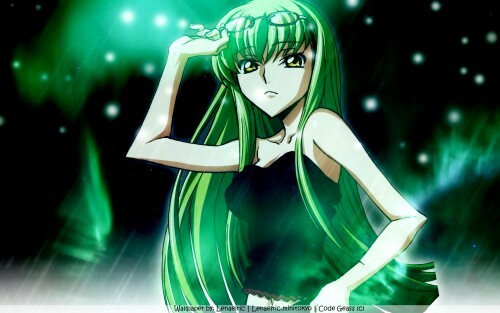 I like CC from code geass thanks!